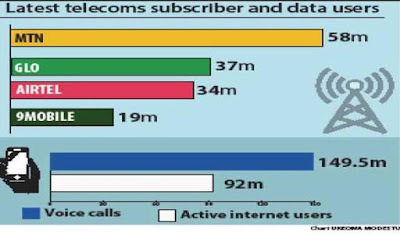 Findings by Daily Trustfrom the four GSM operators revealed conservative estimates of category of data users and how much they spent on data monthly. About 5% of the internet customers or 4.6m buy N10,000 data each, increasing the GSM and mobile internet companies’ revenue by N46bn, according to findings made by Daily Trust. You will also recall that the latest Monthly Subscriber/Operator Data released by the regulator last month showed that MTN had 58,121,427 users, and Glo 37,270,100 customers, Airtel 34,336,802 while 9mobile has 19,621,806 users. The remaining figures were shared between the other smaller operators. If Telecoms operator in Nigeria make over N197billion every month from data subscription, why are they clamoring for increase in data price again?